Only 39% of Americans have enough money in their savings accounts to cover a $1,000 emergency according to CNBC. This means that the average person is one paycheck away from not being able to pay their bills at all. I’ve been there before, and it’s a very uncomfortable reality. I remember it being my daughter’s 4th birthday and thinking that I didn’t even have enough money to buy her a cake without sacrificing food for the next 3 days until payday. I remember literally crying because I felt like I had failed both myself and my daughter. It was such a horrible feeling to stomach. Thankfully, I checked my bank account and realized that my credit union deposited my check early because my semi-monthly pay date fell on a Monday (Thank God!). Though I was both relieved and elated that I was able to make her birthday special, however, this was a HUGE wake-up call! I made up my mind that I would NEVER be in this situation again. One of the first things I decided to do is take inventory of myself, and figure out why I was living paycheck to paycheck. 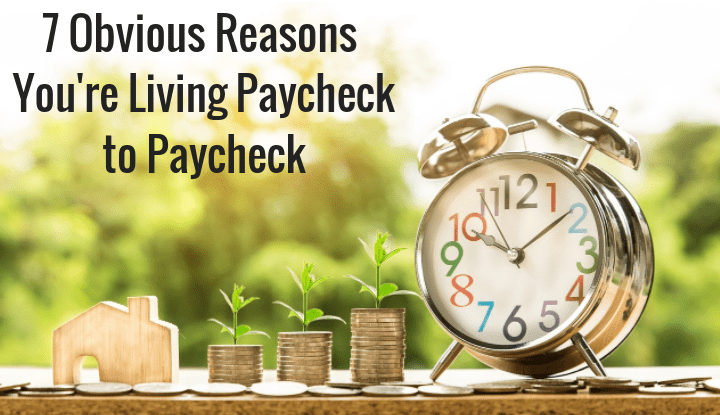 After taking a closer look at my habits, and circumstances I was able to identify a few reasons that were holding me back from financial success. I want to help you stop living paycheck to paycheck too. Let’s jump right into them below! Not being organized can cost you big time in dollars. This relates to everything from creating a grocery list, to just keeping your house clean. Think about it. How many times have you gone to the grocery store, only to get home and realize you’ve purchased items that you already had at home? At this point, you’ve ended up spending unnecessary money that could have went towards savings. The same goes for not knowing where to locate certain items in your home that you might need. If you are unable to find them, you may end up spending extra money to replace them. With that being said, it’s also a good idea to get rid of any unnecessary items that you are no longer using. Even better, sell them on sites like Offer Up and make a few extra bucks in the process. Getting organized is one of the first steps to financial success! Do you find yourself seeing something you like, and buying it every time? Is your mindset, “I want it, and I want it now.” You may struggle with immediate gratification, which is when you want to experience a certain pleasure without any delay. When it comes to spending money, this could be an extremely risky behavior. I recommend avoiding shopping online if this an issue of yours. It’s so easy to go to your favorite website and load up your cart without even thinking about your budget. Before you know it, you’ve spent more money than you originally may have planned just to satisfy a temporary want. We’ve all heard the phrase, “Keeping up with the Joneses” before. Basically, it just means comparing what you have (materialistically) to what others have. With the power of social media, it’s easy to get caught up in the comparison game. If you feel that you don’t have as much as the next person, you may feel that you need to go out and buy what they have – even if you can’t afford it. Do you find yourself having to grab the latest smartphone, as soon as the upgrade comes out? The problem with this mentality is that you don’t always know other people’s circumstances, or how they obtained what they have. Your circumstance may be completely different, or maybe you haven’t put in the effort to obtain those things yet. Either way, you could be putting yourself in a situation to spend excess money that you could be saving. The good news is after you build your savings you will have more opportunities to treat yourself! One of the best ways to get ahead financially is to set savings goals. Goals are important because they set milestones, and hold you accountable. Setting financial goals will also give you a sense a fulfillment as you meet and exceed them. The first step after coming up with your savings goals is to come up with a plan on how you will achieve them. Your goal could be to build your emergency fund to $1,000. Once you make this a priority, you are more likely to take steps to get there. Learn how to save $1,000 fast and create an emergency fund here! This one may be a rude awakening for some, but the harsh reality is that some people are just too comfortable with their current situation. Maybe you’ve been at the same job for 5 years or more, and you have gotten into a set routine. Or maybe you just are used to penny-pinching, and don’t think it’s possible to break that cycle. Change can be scary for most people! Trust me, I know. But the reality is that your circumstances are less likely to change if you don’t change your habits. Apply for that new job, start that side hustle, automate your savings, do something new! Your life could be totally different this time next year based on the decisions that you make today! I decided to save the best for last! If the whole time you were reading this article you were thinking, “There’s no money left over after I pay all of my bills. That’s why I’m living paycheck to paycheck.” – then you are probably right. One of the most common reasons most people are living paycheck to paycheck is because they simply aren’t earning enough money. With that being said, the quickest way to boost your income is to earn more money! I am a walking testament to this, and I could honestly write about this topic all day. I left one of my first professional jobs and got a $14,000 raise at the new company that I joined. I then left that company for a $34,000 raise at the next company that I joined. For those of you wondering, I don’t have a college degree or any special certifications. I simply wasn’t satisfied with my current salary, and applied to new jobs and asked for a higher one. I plan to write a more detailed article on this in the future. Feel free to leave comments if you have questions on this in the meantime. My point is, it’s possible! All of the reasons that I listed here are things that you can work to begin changing today! You can do this if you believe that can. All it takes it changing a few habits and taking action where it matters most. You owe it to yourself!